This should really be a very short blog – ski conditions are fantastic. However, what fun would that be? 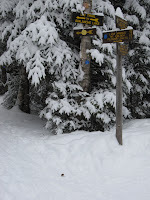 I did a little research on behalf of you, my loyal blog readers, yesterday in the back country. The Adirondack back country skiing is indeed fantastic. There was about 18 inches of fresh powder on a nice thick base at 2,800 feet. Even the little mouse who couldn't decide which trail to take was having a great time. A word to the wise though: don't try skiing the slides right off the bat if you are new to back country skiing. You could start out skiing the nice trails all around the Adirondack Loj at Heart Lake. This lovely trail system and wilderness facility is operated by the Adirondack Mountain Club and is a perfect location from which to start any wilderness adventure. 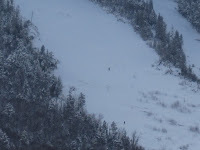 Reports from Whiteface Mountain indicate skiing there is simply superb. It is a stunning day here in the Adirondacks and skiing's great in New York State! All the more reason to celebrate - Yippee!